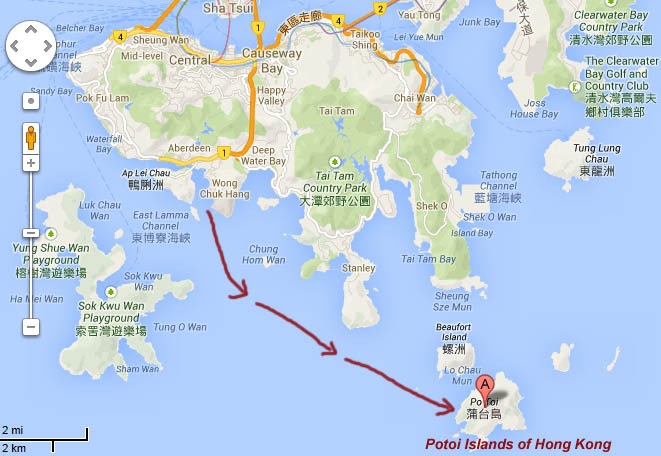 Potoi Islands of Hong Kong can be reached by ferry from Aberdeen or by your private boat. 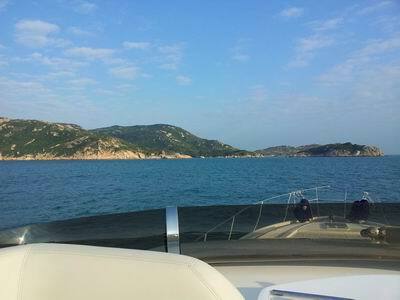 Normally it takes around 30 minutes from Aberdeen to Potoi from a 20 footer speed boat, the one which we ride on, which is a Karnic speed boat. Potoi is considered to be one of the oldest islands in his region which was inhabited by people. Its main resource in ancient days was fishing. 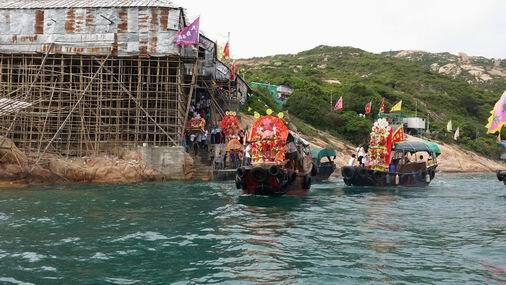 It is believed that Hong Kong had many clans which were based in islands around and were traditionally fishermen. In the ancient times they had the sea festival which is called in Cantonese as “Tin Hau bo dan” translates as the birthday of the queen which likely marks the start of the fishing season. We can only imagine how elaborately this must be celebrated in the old times, with all these clans coming together and competing to get trophies made by temple priests. These trophies define the status and strength of the particular clan that wins them. This year on April 22nd, we had a chance to visit the Potoi island and see its traditional sea festival which still continues till today, but in a lighter and more modern manner. Where many groups of fishermen participate in boat racing and claim trophies which are made by the temple, which symbolizes good luck and fortune for the year ahead. We are lucky to take a few snaps of pictures of this event. 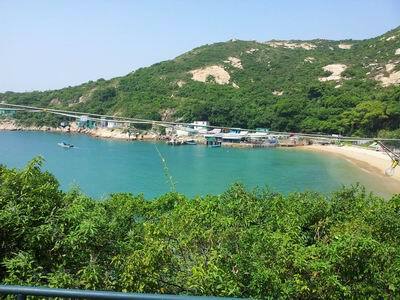 Potoi generally is a place that people from Hong Kong like to visit during the weekend for some authentic traditional seafood and a dip in the sea. The island also has a hiking trail and some old rock formation and there is known to be a haunted house in there. Its surely a fun island to go on a sunny weekend. Below are some pictures. Above is a direction map to go to Potoi Island. Its basically south east from Aberdeen. A beautiful beach with some traditional sea-food restaurants. 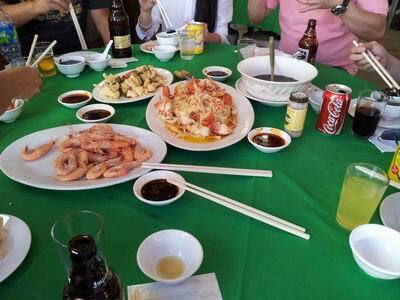 Fresh seafood in Potoi, truly tastes different than the city restaurants. 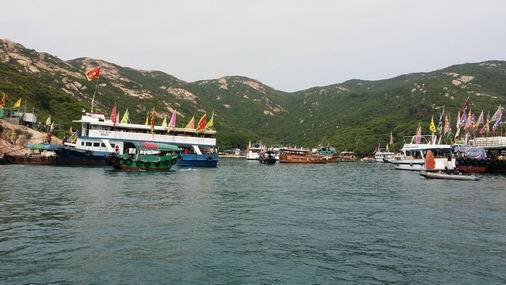 Boats moored near the Potoi islands during the festival on April 22nd 2014. Normally the space is occupied by private boats which are there to enjoy the sea-food, but not on this day. This day by some is still taken very seriously as a day to win the trophy presented by the temple to ensure their yearly safety and fortune from the god of the seas. 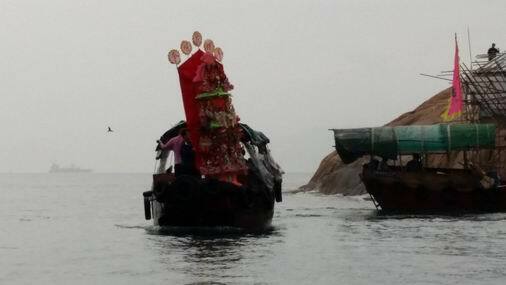 Fishermen taking home the trophies from the temple. A trophy in a traditional Hong Kong Sampan.